minimum of 180 in the 2018 UTME. 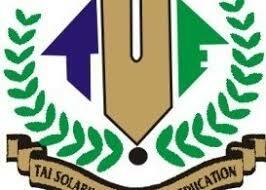 TASUED through which the Admission portal can be accessed. screening exercise payable online with either Master card or VISA ATM card. to submit and verify their �O� level result. identification/admission card for the screening exercise. the application invalid and such candidates shall be disqualified. Campus of the University on 14th August, 2018.
requirement for entry into Tai Solarin University of Education. Admission portal after the screening exercise.